An adaptation of a series of children’s books created by René Goscinny, notable for the Astérix comics, and illustrated by Jean-Jacques Sempé, a French cartoonist. Le Petit Nicholas was directed by Laurent Tirard and released in 2009. The movie centres around a boy named Nicolas, in his iconic red slipover and his mischievous smile. Nicolas, played by Maxime Godart, is a child between the ages of 7 and 9, born into a middle class family of the 20th Century. The movie is set in Paris in 1956, and at the very onset you meet Nicolas’s family; his prim and proper mother (played by actress, singer and scriptwriter, Valérie Lemercier) trying to fit into a materialistic and judgmental society, and her husband (played by French-Algerian actor, Kad Merad), the model salary man trying his best to please his boss and keep his family happy, and a funny guy who keeps them -and us- entertained. The story can be credited with a rather realistic portrayal of marital life, its up-and-downs, and the effects of society on it, while at the same time managing to keep it all light and funny, with an occasional darker or more cynical undertone. 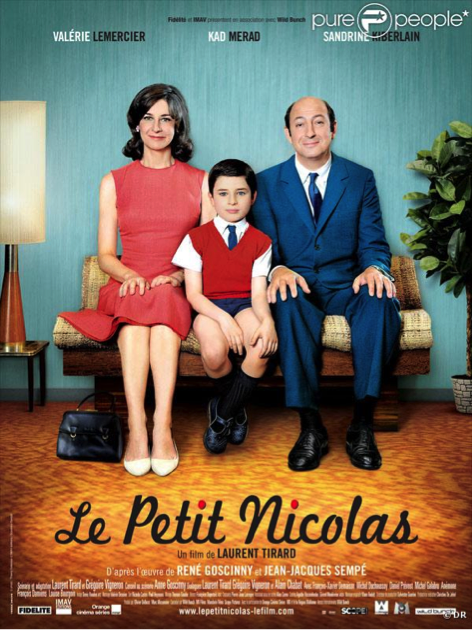 The movie switches between Nicolas’s life at home and his life at school, all from the perspective of Nicolas. We meet his friends and we are drawn back into our own childhood, the fun games, the class clichés- we re-meet the class trouble maker, the sleepy head, the food lover, the class nerd or teacher’s pet and the bully; all of them reunited under the umbrella of an interesting, naïve understanding of life. We follow him as he tries to make sense of the challenges he encounters and watch with eyebrows raised, a smile on our lips or a full belly laugh as these enthusiastic and energetic boys try to help their friend Nicolas. Enjoy watching these boys get themselves into a number of mischiefs in school and of course be prepared to feel the frustration of the superintendent ‘Monsieur Dubon’, also known as ‘le bouillon’ (old spuds) as he tries to foil their plans. Live a realistic-yet-comical re-enactment of life in Paris 1956- the social constraints, the struggles of a middle class family, the struggles of very dynamic children, the squabbles of daily life and of course the beauty of friendship. Watch to find out about Nicolas’s perception of life and the solutions he finds to his problems, and how this vast world and all its complexities appear through the eyes of this child. Tags: ETC. Magazine, featured, film, french film, french movie, Laurent Tirard, Le petit Nicolas, movie review, Taylor's University, Taylor's University Lakeside Campus, TULC, Wanderlust Wednesdays. Bookmark the permalink. Whoa, I just finished watching this movie a week ago, not knowing it was shown in Taylor’s >_< As a Malaysian, this movie was a great French movie experience as, well, we most know, French people will include above 18 scenes whenever they can. As this movie is targeted towards family and it is a comedy, I was relieved to find it safe for me to watch the entire movie without skipping any raunchy scene. Great review. I agree with most of the review and it was nice you included the score from rotten tomatoes and imdb.